This chart summarizes those elements within various Gnostic groups that the majority of Christians found especially troublesome. A particular Gnostic sect would not necessarily have held all of the following beliefs. GOD - There are two opposing Gods: the supreme, spiritual, unknown Father who is distant from the world and revealed only by Christ; and the subordinate, ignorant, and evil creator of the world (Demiurge). WORLD - The material world crafted by the Demiurge is evil and keeps the spiritual ones from perfection. It must perish and be escaped. HUMANITY - The Gnostics are by nature the elite, spiritual ones, for they have the “seed” of the spiritual realm inside them. This divine spark (the spirit) is trapped within the material, fleshly body and yearns for release from this evil dungeon. SALVATION Only the immortal spirit of the Gnostic is saved as it gains release from material captivity and returns to the Father's spiritual realm. Salvation is by knowledge (gnosis)—by knowing that the true God is the Father, not the Demiurge, and that the true home of the spirit is its place of origin, the Father's realm, not the material world with its bodies of flesh. CANON and HISTORY There are gospels and testimonies of the apostles that convey the perfect revelation of Christ in addition to (and in some ways superior to) the church's four gospels. 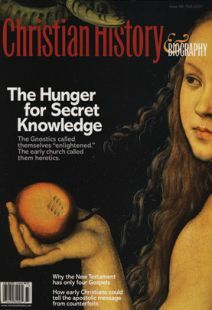 This revelation brought by Christ manifests the true knowledge of the Father and the Gnostics, while the Law and the Prophets mamfest the Derniurge. GOD - There is only one true God who is the Creator of the world and the Father of Jesus Christ. WORLD - The material world was created good by God. It will someday be renewed and made into a fit home for the redeemed. HUMANITY - God created all human beings as a union of body and spirit. We are not spiritual by nature —this is a gift available to all by faith through the ministry of the Holy Spirit. SALVATION Both the immaterial and material aspects of God's creation are saved. By faith in Jesus Christ, a person receives the Holy Spirit who provides spiritual life, resurrects their flesh to eternal life, and redeems the created world. CHRIST Jesus Christ is the one and only Savior, the eternal Son of God made flesh, who truly suffered for the sins of humanity and was truly raised in immortal, incorruptible flesh for their resurrection to eternal life. CANON and HISTORY The church recognizes only four gospels, Matthew, Mark, Luke, and John, and believes that these four, along with the rest of the New Testament, are in harmony with the Law and the Prophets. All witness to the one true Creator and Father, his Son Jesus Christ, and the Holy Spirit.